Kobelco Construction Machinery Europe B.V. (KCME) is pleased to announce the arrival of its latest “Generation 10” specialist earthmoving and construction excavator available from the growing European Kobelco dealer network. The SK300LC-10 is designed to provide exceptional low emissions and increased working performance to maintain unparalleled working efficiency, and is the latest Kobelco conventional excavator to comply with Stage 4 exhaust emissions regulations. Strength and power has always been at the forefront of Kobelco innovation and the new SK300LC-10 is testament to this. Providing the driving force behind the machine is a Hino turbo-charged 7.68-litre engine. This engine is the same unit that powers Kobelco machinery from the higher 35-ton operating class and, therefore, its powerful 186 kW output makes the SK300LC-10 a top performer in its class. Reinforcing the performance aspect is the superb bucket digging force of 209 kN as well as drawbar pull and swing torque figures that are among the highest in class. Fuel efficiency through refinement is an important aspect in all Kobelco designs in order to save operating costs. The refinement of trusted power-plants has led to a decrease in fuel consumption in Eco-mode/S-mode and maximising fuel efficiency in H-mode. At the same time, the powerful engine performance ensures the SK300LC-10 delivers class-leading work volume. As with all Generation 10 engines, the SK300LC-10 features the very latest in ‘clean technology’ and wears a globe motif within the corporate colour scheme to denote global awareness. Advanced systems featured are: DOC (Diesel Oxidisation Catalyst), and the combination of SCR (Selective Catalyst Reduction) and DPF (Diesel Particulate Filter), which reduce the amount of DEF/AdBlue fluid consumption and meet stringent Tier IV emissions regulations. Serviceability and operator refinement on the SK300LC-10 is greatly enhanced. The latest upper deck/cabin profile mirrors the highly regarded SK350LC-10 and provides easy access to the engine compartment for daily operator checks and scheduled servicing needs. At the same time the deck/cabin layout provides the operator with wide visibility to the right side. The cabin itself is spacious and accommodating with the usual Kobelco-user refinements, including the latest media unit and air-con delivery vents for maximum effect. Operator control levers have a lighter-feel, and a new ‘lock’ lever and control lever box are also featured. High durability of Kobelco construction machinery is amplified by Generation 10 machines and the new SK300LC-10 is no exception. 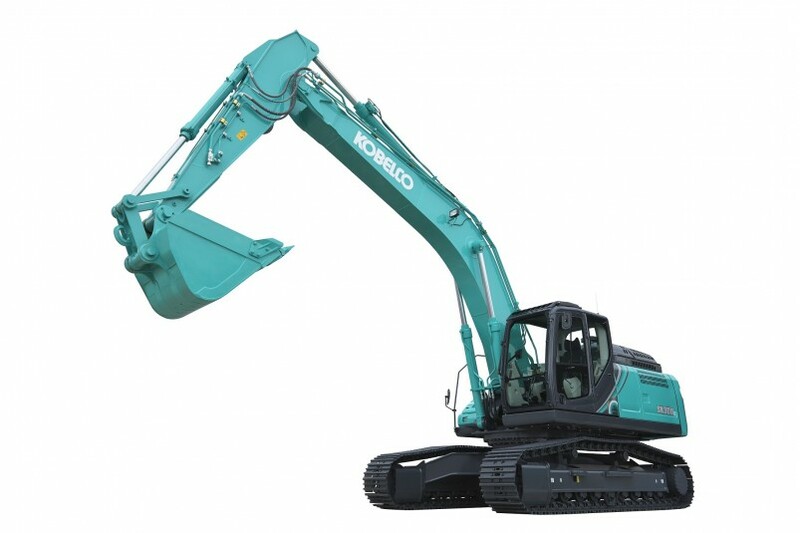 Featuring the latest engineering aspects in boom and arm design by incorporating revised structural sections, reinforcement points and pin bosses, backed up with the latest improved Kobelco hydraulic and fuel filtration system, the SK300LC-10 easily achieves the daily demands and longevity required of a Kobelco excavator regardless of working environments and conditions. Extending the SK300LC-10’s area of work parameter to include exceptional rocky terrain is the option of 600mm double-grouser shoes to the standard triple-grouser items. Ease of transportation was also a key factor during the design process of the SK300LC-10. Although this machine has all the substantial benefits of a 35-ton category engine, including cabin and upper frame (excluding the counterweight), the lower carriage was designed for the 30-ton category. Depending on machine configuration, the operating weight of SK300LC-10 (min/max: 31,400/32,200 kg) takes into account work applications in countries with transport limitations e.g. Germany. 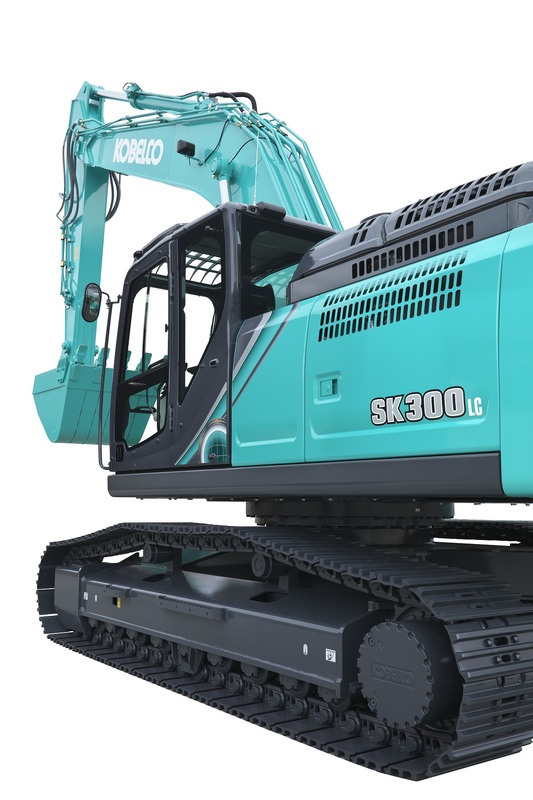 Commenting on the introduction of SK300LC-10, KCME Product Marketing Manager, Peter Stuijt, said: “Kobelco is renowned for continuous product development to ensure its products are innovative class-leaders that perform in all areas. The latest example is the new SK300LC-10.